May, is married with three grown children plus now three wonderful grandchildren. A self taught artist of over forty five years. She has lived all her life in the same area and wouldn't think of moving. Nature and living by the Bay of Fundy feeds her soul. She has been self employed for over twenty five years. 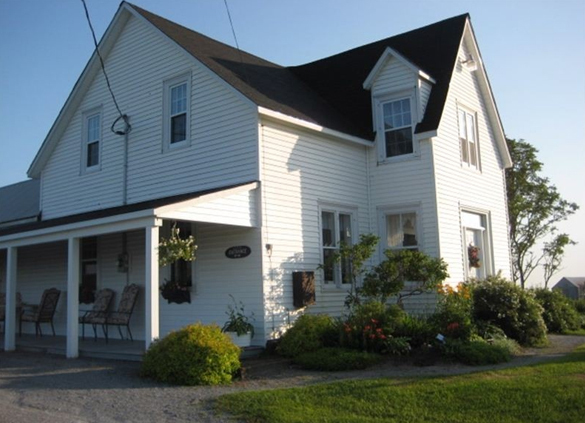 Opened the doors in 1999 to her Bed and Breakfast, which was her family homestead and renovated it with help to make it more comfortable for her guests. Operating and owning the Tourist Home and gallery for the last eighteen years and meeting all the different guests from all over the world makes it stay fresh and fun. She is always wondering where the next couple is coming from. Being an artist for over forty five years has been her biggest pleasure and gives her an outlet to express herself and to relax with over the years. May, loves to paint pictures that people can relate to or that means something to a person for some reason of their own. 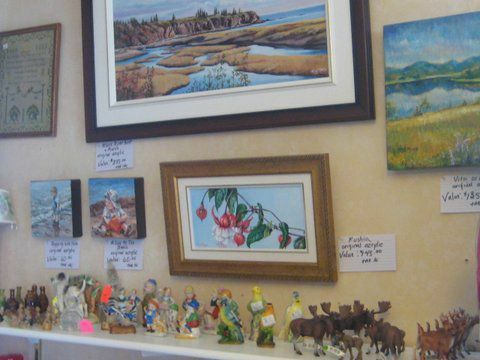 May will do a lot of commission work for people of the area and also have sold countless numbers of paintings across Canada ,overseas and in the United States. Taking great pride in knowing that a little piece of herself is hanging all over the world. Places she may never get to herself. May's other interests includes: cooking, music, animals, walks on the nearby beaches, watching a good show on TV. and ofcoarse family gatherings. Every minute spent with family is a treasure. May, likes guests to feel at home in her home and hope that they take time to breathe and relax while in our slower pace of lifestyle here in this little rural area near the beautiful Bay of Fundy. Mother always said "if you have something worth sharing , a person should share it with others". She took on this project in memory of her and her father. Very proud to say that she is from Gardner Creek, New Brunswick, Canada. My home was left to me from my parents and the location is so spectacular it made perfect sense to do this with the old farm house. High on a hill overlooking the beautiful Bay of Fundy, in a peaceful, caring community. The old farm house was designed so well to do something like this that it all worked out in the long run. A few new renovations in bathrooms and new kitchen updates made it work. People love the space and quietness that it offers to them. I had one guest sitting out in the chairs on my veranda one morning meditating as the sun came up over the bay and he said he had not experienced another situation like this in his travels for a long time. That made me feel so good for him and the fact that I had decided to do this for others to enjoy. Big cities are great but sometimes you just need to get out of that noise and confusion and take time to breathe fresh clean air. * Home cooked breakfast is always a big hit for my guests, everything is homemade right down to the homemade bread and jams offered. I always have homemade sweets in the kitchen for them to snack on throughout the day and tea and coffee. * The quietness of the evening is another big bonus and not having to get up too early if you want to sleep in for a change is nice for some. * Some of the finest scenery surrounds this house sitting high on a hill top overlooking the Bay of Fundy. * Free wireless internet through out the house. * Lots of outdoor seating and tables for relaxing or dinning at plus propain barbeque. * Large acreage for children to play and guests to enjoy. * Free off street parking and parking for motorcyclist. * Centrally located between the city of Saint John or the village of St. Martins, makes it nice to do day trips to either area and return home to quiet. Even outside of this range, one can be in Sussex or St. Stephens within an hour or two, which is nice when you want to do day trips here and there. * Everyone is treated like family or a friend while staying, so just be yourself and we'll be fine.Our Maritime hospitality is our biggest feature. * Having full use of the kitchen to cook for yourselves throughout the day is a big plus for a lot of my travellers especially with children travelling with them. Helps to cut costs so one can go and enjoy some of the finer things we have to offer. * The laundry is available to my guests too and we have a clothes line outside where they can if they want to hang out their clothes to get that fresh salty air smell. I hang most of my linens out there daily to dry for the bedding on the beds upstairs. * A dryer for days that one is too busy or too wet.